The process of coming to terms with its National Socialist past has been a long and difficult one in Austria. It is only over the past thirty years that the country's view of its role during the Third Reich has shifted decisively from that of victimhood to complicity, prompted by the Waldheim affair of 1986-1988. Austria's writers, filmmakers, and artists have been at the center of this process, holding up a mirror to the country's present and drawing attention to a still disturbing past. Katya Krylova's book undertakes close readings of key contemporary Austrian literary texts, films, and memorials that treat the legacy of Nazism and the Holocaust. The analysis focuses on texts by Robert Schindel, Elfriede Jelinek, and Anna Mitgutsch, documentary films by Ruth Beckermann and by Margareta Heinrich and Eduard Erne, as well as recent memorial projects in Vienna, examining what these reveal about the evolving memory culture in contemporary Austria. 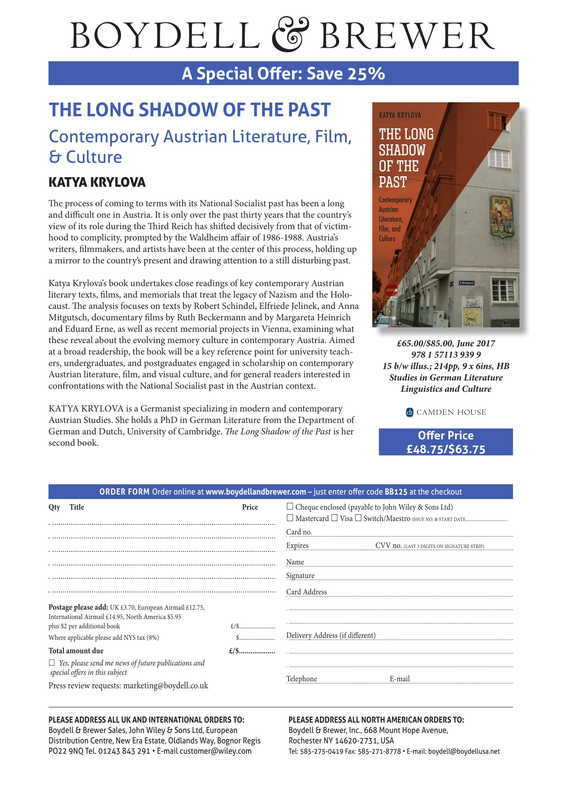 Aimed at a broad readership, the book will be a key reference point for university teachers, undergraduates, and postgraduates engaged in scholarship on contemporary Austrian literature, film, and visual culture, and for general readers interested in confrontations with the National Socialist past in the Austrian context. The Long Shadow of the Past was included in CHOICE's 2018 Outstanding Academic Titles. The list, published annually by CHOICE (the journal of the American Library Association), is "used by librarians to identify the most innovative and valuable titles for collection" (http://choice360.org/librarianship/outstanding-academic-titles). "Krylova has produced a timely, informative, engaging, and well-written treatise on Austria’s ongoing memory struggles. Her monograph would be informative and digestible reading for students in a course on the topic, and should be of interest to all scholars concerned with how Austria and other nations confront the long shadow of the past." "Katya Krylova’s excellent new book was completed between the presidential and national polls. [...] Krylova’s introduction gives an excellent overview of the diverse strands of activity; her five chapters offer detailed analyses of particular works.[...] Krylova is able to develop a fascinating narrative." "Krylova's carefully researched The Long Shadow of the Past is a must-read for Austrian memory study scholars. It captures profoundly interconnected worlds of memory, trauma, and repression of the past with politics, culture, history, and family histories; it recognizes both progress and setbacks in Austria's reckoning with its past; and it invites an open dialogue about cultural memory." "[A] fascinating study [...]. This book provides an outstanding analysis of the most important aspect of contemporary Austrian cultural and literary identity, which focuses on the remembrance of crimes committed by the Nazi regime [...]. Any scholar interested in understanding Austria's cultural identity today has to read this book to understand how important this work of remembering is for Austria to move forward. [...] a must read for all scholars interested in Austrian literature, film, and culture." "Krylova’s book is a timely and welcome addition to various fields of study, among them, memory studies, Holocaust studies and Austrian cultural studies. Krylova’s analyses demonstrate what happens when trauma and repressed national history continue unresolved." "Krylova's essays are thoroughly researched, lucidly written, and should be of interest to students of cultural studies and history." "This is a well-considered study of Austrian Holocaust denial and the ways in which film, literature, and memorial images have led the nation toward a complete understanding of its share of guilt in the events of WWII. [...] Highly recommended. Lower-division undergraduates through faculty; general readers." ​​© 2015-2019 Katya Krylova. All rights reserved.